There are two gardens on the roof at the Fairmont Hotel. One has a picturesque green lawn, a fountain, and an array of decorative trees and flowers. In other words, it’s exactly what you’d expect from a Nob Hill hotel. Nearby, on a smaller terrace, is something less expected: a culinary herb garden. Raised beds brim with lavender and rosemary, a small compost bin is visible in one corner, and, off to one side, honey bees busily travel to and from three large hives. The garden where the hives were placed last June is located above the Tonga Room, on a sunken rooftop that gets morning sunlight and allows for a good flight pattern. “If it had been any higher, there would have been too much wind,” says Helene. 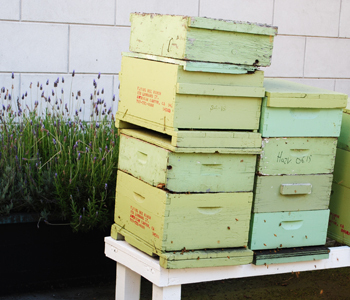 At first, she and her husband Spencer, who does the majority of the beekeeping, were a little worried about the bees having enough to forage in the two-mile radius around the hotel. “Spencer was skeptical, but when he goes to visit the bees they’re always active and healthy looking,” she says. Foster sees the bees as part of a larger effort to engage his staff and guests in the world of sustainable food. He says that more than half of the food prepared in the hotel’s kitchens comes from local farms (Allstar Organics, for instance, drops off a box of produce every three days), and Foster’s staff breaks down a portion of their own meat from whole and half animals raised on local ranches. 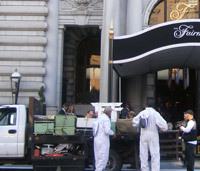 The chef has read widely about colony collapse disorder and says he hopes that hosting bees on the Fairmont’s roof will bring some awareness of the importance of preserving their health. “[As pollinators], they really are crucial to so much of what we eat,” he says. The hotel has included information about the bees on their menus and website, and Foster has high hopes for expanding the garden. “When we put in a greenhouse, I’d even like to try growing tomatoes,” he says. The hives have only produced around 120 pounds of honey so far — not enough to stock the hotel’s kitchen, but Foster does use it here and there in his recipes. “It’s in some of our ice cream, pastries, vinaigrettes, and wherever else I can find a place for it,” he says. Will the Real Honey Please Stand Up?